I simply cannot agree with the top critics’ general consensus of Ben Stiller’s The Secret Life of Walter Mitty. Stiller does a wonderful job taking us on an adventure of that blends fantasy with reality in a way that is sure to spin your wheels. It would of been easy with this premise where imaginations over imposes on the story but Stiller does a nice job of bringing it back when needed to keep the film pretty fluid. There is a sense of commercialization that can be distracting but it’s kind of silly given that there is so much else more going on. Stiller uses some really creative camera work, especially in transitions and sometimes even for a little humor. In one instance, he uses the x-ray machine as a perspective as his character is traveling through an airport and it was pretty funny the way it was executed. Stiller even brings a pretty creative action sequence that was shot really well. The big thing with Walter Mitty however, is that you have to suspend reality a little bit for the film to work. Some scenes are very contrived and only work when you are in their world and not trying to put these characters in the real world. If you can do that, you’ll have a lot of fun with this movie. The story follows Walter Mitty, who is the Negative Assets Manager for Life Magazine, and is someone who loses himself in daydreams frequently. Mitty is kind of lonely and shy, who’s put work and family as his main priorities in life leaving him single with only his fantasies. When Life Magazine is bought out and is downsizing to become an online company only, Mitty is in charge of delivering the final cover image, which was shot by the famous Sean O’Connell. However, when Mitty and his partner can’t find the image, Mitty sets himself on an adventure to find the mysterious image. All while this is going on, Mitty is in pursuit of a co-worker, Cheryl, whom he kinda likes. And in doing so, he creates an E-Harmony page to learn more about Cheryl, but in turn, he ends up developing a funny relationship with one of the customer service employees. The story goes back and forth from imagination to reality (again, a term I use loosely) really well and in some fun and creative ways. While the relationship and E-Harmony subplots aren’t 100% necessary, it gave Mitty some character and it wasn’t too overbearing in screen time. What makes this story work is the fight within Mitty himself to live this adventure and creating a meaning for his life, even when things aren’t going his way. Even though the real world is more of a simulation, the heart of the story is still there and it works great. It’s inspirational and something that will be relatable do all the daydreamers out there looking for more in life. MOVIE REVIEW: American Hustle is wildly entertaining! 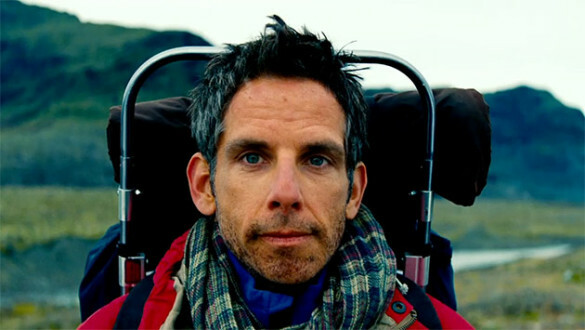 Ben Stiller is genuine as Walter Mitty and gives a refreshing performance. While he does bring some comedic timing to this role, it’s more serious and he sells the daydreams. As a character who loses himself in thought, Stiller had sell his “zoning out” which he does beautifully. And it’s always great to see an actor go against the grain of his usual performances to give you something more and Stiller does that well here. Kristen Wiig doesn’t have as much to do, but when she’s on screen, she’s great and had good chemistry with Stiller. All of the supporting roles are limited, but when they are on screen, they get the job done. I especially enjoyed the short cameos of Sean Penn and Patton Oswalt. Adam Scott’s performance was a little over-the-top and not as believable in this world comparatively but given the goal of the character, it still works. What an absolute beautiful and outstanding score by Theodore Shapiro. It’s powerful and moving when needed to be, especially as Mitty is traveling though gorgeous landscapes that needed gripping music to lift the scene. The action moments even have some intense music that would leave Jason Bourne a little jealous. And the soundtrack? Absolutely incredible. Music lead by Jose Gonzalez among others that will end up being one of the best soundtracks of the year. And Stiller used the music perfectly to enhance the film. The Secret Life of Walter Mitty is really fun and one of Stiller best works, if not his best. While some subplots and the commercialization can be a side track, none of it should be. There’s so much more to this film. Mitty is an intriguing character that everyone can relate with in some ways. He just wants life to be an adventure and for it to become something more, which is a premise most people I think would want. The story takes off in some creative ways and is really charming that is for sure to be enjoyable. Again, lay down realism and forget the product placements and you’ll enjoy The Secret Life of Walter Mitty.